The Maple Leafs’ right-winger cradles the puck in his opponents’ end, skating back and forth along the boards as a Canucks’ defenceman, just out of reach, shadows each of his movements. The dance continues for what seems like an age, until the winger sees his opening — the defenceman is slow to follow him from the corner, so he passes the puck over to the centreman, who spins and fires. The goalie slides toward the near post, but not in time. Spectators roar their approval (or disappointment) as the puck crosses the goal-line, but the players themselves betray no emotion as each skates silently to centre ice for the ensuing faceoff. It’s a scene that has played out millions of times. For close to 60 years now, table hockey, or any of the names it goes by, including slot or rod hockey, has been a staple of growing up in Canada. Certainly for most boys, and many girls, and particularly in the 1950s, ’60s and ’70s, the sight of a wrapped box of a certain size and shape under the Christmas tree meant only one thing. But as the Canadian version of slot hockey got its skatehold in living rooms and rec rooms across the country, the person largely responsible for its development and evolution in those first decades was a Vancouver-born man who, only years before, had not been particularly welcome in his own country. 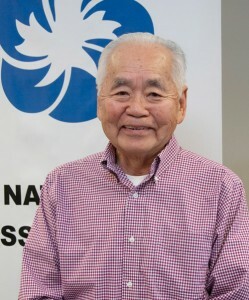 Bill Kobayashi was 15 years old in December 1941, when Japan attacked Pearl Harbor, and helpless to do anything in the face of the escalating anti-Asian racism in Canada that resulted. For him, it was simply a fact of life. One of his brothers, Phil, who ran a Vancouver trucking company that worked largely with lumber interests, helped the family avoid internment when he, along with a lumber broker and the owner of Terminal Lumber & Shingle Co., proposed building a mill in B.C.’s interior, in Blind Bay on Shuswap Lake. Ten Japanese families, including Kobayashi’s, were permitted by the government to move to Blind Bay to build and run the mill. The business failed before the war ended, however, and the Kobayashis moved to Kamloops, B.C., where Bill worked at various menial jobs, including in a hops garden, in a lumber camp and on his father’s leased 10-acre produce farm. Changing jobs was difficult for everyone then. The Wartime Prices and Trade Board had a firm grip on labour, and if a person wanted to even look for another job, he had to first get the board’s permission. When Kobayashi tried, in 1945 after the war had ended, he was told to either go back to his old job or migrate east. Improving his lot in life was only possible if he relocated. “I guess this was part of moving the Japanese-Canadians from the west coast,” he says. So he and his family packed their belongings and travelled by train to Montreal, arriving on Boxing Day. Kobayashi’s path to becoming the father of Canada’s iconic tabletop hockey game was anything but direct. He first found work as a punch press operator, stamping parts for jewelry. To improve on his Grade 8 education, he enrolled at Sir George Williams College — now Concordia University — where he took chemistry, physics and math. He became a tool and die maker, then a tool designer, and was employed to work on T-33 jet trainers. When that was cancelled, he made zippers. He moved to Toronto, where he tooled the first automatic washing machines. He also worked on the Avro Arrow project. He and Addie, whom he met in Montreal, were married, and started a family that eventually numbered six children. It was while on a return visit to Montreal that Kobayashi learned that Ben Stein, president of Eagle Toys, was trying to reach him. The two had met when Bill was working as a tool and die supervisor in Lachine, Que., and Stein, who was expanding his company, wanted Kobayashi as his full-time product and tool designer. Table hockey was not new. Donald H. Munro Sr. is generally credited with inventing the game during the Depression when, unable to afford Christmas presents for his children one year, he and his Burlington, Ont. family built their own. “It was a game that was played with a marble, not a puck,” recalls Kobayashi, “and the ice surface was sloped from centre ice, so the ball always rolled one way or the other towards the net. The players were fixed on the surface, just like a pinball machine, and all they did was spin around in a fixed position. The innovation of slots and metal rods was patented in Sweden in 1937 by Bernt Unger, and games manufacturer Aristospel A.B. started selling it in several European countries the following year. A Canadian patent was issued in 1941, but the game proved difficult and costly to make. In 1955, Eagle Toys took its “prototype” of the game to the annual toy show, prompting Aristospel’s lawyers to threaten legal action for copyright violation. Stein asked Kobayashi to make the game different enough to avoid prosecution. Bill loved to attend hockey games. In the latter years of the 1940s, he bought standing-room tickets to the Forum to watch the likes of Kenny Reardon and the Punch line combo of Elmer Lach, Toe Blake and Maurice Richard. Later, he took his kids with him to games. Meanwhile, Eagle Toys’ hockey games grew in popularity, and Stein and Bill added new gimmicks and features each year to keep interest high. The NHL allowed them to include replicas of the Stanley Cup and a handful of other trophies. They got endorsements from players, including Jean Beliveau. One of the major oil companies offered free games with a certain number of fill-ups. Eagle Toy’s New York sales rep also managed to secure the NHL’s permission to use actual team logos on the game’s players and sideboards, and soon it was selling in the United States as well as in Canada. At its peak, Eagle Toys — and Coleco, which bought Eagle in 1968 — was selling close to 100,000 games each year. Kobayashi, meanwhile, continued to develop the game. A goal light was added, with the weight of the puck closing an electrical circuit and lighting a red light behind the net. The puck wasn’t heavy enough to reliably set off the light, though, and the feature was discontinued. An overhead score clock was also developed, with Westclox in Peterborough, but that, too, was abandoned to achieve a lower cost. A mechanism at a spot on the ice near the faceoff circle in each end, allowed teams to add a sixth attacker during the final minute of play, essentially pulling their goalie for another skater. A ball bearing was briefly added to the middle of the puck in the — mistaken — belief that the increased speed would make the game more exciting. Plastic, moulded 3D players, which many youngsters painted by hand to resemble their hockey heroes, were also tried, with less-than-favourable results. He was also instrumental in developing and implementing Top Corner hockey, a rod-and-slot hockey game in which players could raise the puck on wrist shots. In 1974, Kobayashi left Coleco to work instead for various companies in Cambridge, Toronto, Florida and Tottenham before retiring. He also served as president of the Toronto chapter of the National Association of Japanese Canadians. When Coleco filed for bankruptcy in the late 1980s, its rights to table hockey were purchased by Irwin Toys, which today manufactures two versions of the game: a small, inexpensive one called Pro Stars 2, which retails for about $40, and the larger Power Play 2, at about $70. On the promise of a two-day workweek, Kobayashi was lured out of retirement, and soon found himself working full-time for Irwin as its plastics procurement expert, but also keeping a hand in its table hockey development. Other companies, meanwhile, chiefly Swedish manufacturer Stiga, also make similar games. Competition from other hockey games, such as air hockey and domed, foosball-type games, as well as electronic and other Xbox-type ones, has put the hurt on rod hockey. Peter Irwin, of Irwin Toys, says his company sells about 10,000 table hockey games each year, and while that number could easily double in what he says is a fluctuating and cyclic market, it’s a far cry from the 100,000 that once rested under Christmas trees each year. The appeal isn’t all nostalgic, however. Table hockey leagues exist in major urban centres across Canada and the U.S. The International Table Hockey Federation, for example, is holding its championships next month in Las Vegas. Kobayashi, meanwhile, finally retired a few years ago, in his mid 80s. Now 87, he and Addie live in Richmond Hill, just north of Toronto. He’s extremely modest about his role in the development of table hockey, but concedes it’s a “nice thought” to consider that it may ultimately be his legacy. “It feels good,” he says. “Certainly, there was a satisfaction from seeing that people enjoyed the game. Kids enjoyed the game, and for some years it was the No. 1 toy for boys asking Santa Claus for a gift. Previous story What’s Racist and What Isn’t. Is It OK to “Single Out” Races in Public Forums?